As y'all know, back in December, the media, this website, Twitter folk and GO Transit customers rattled some cages demanding answers why the Burlington project is entering year five of an estimated three year construction project. For a two week period over Christmas, there was a flurry of activity at Burlington. Now it appears that progress is right back where it was before - barely there, complete with outdated notices. 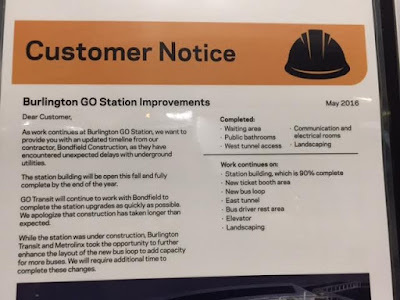 "As you probably know by now construction at the Burlington Station has been disappointing at best. 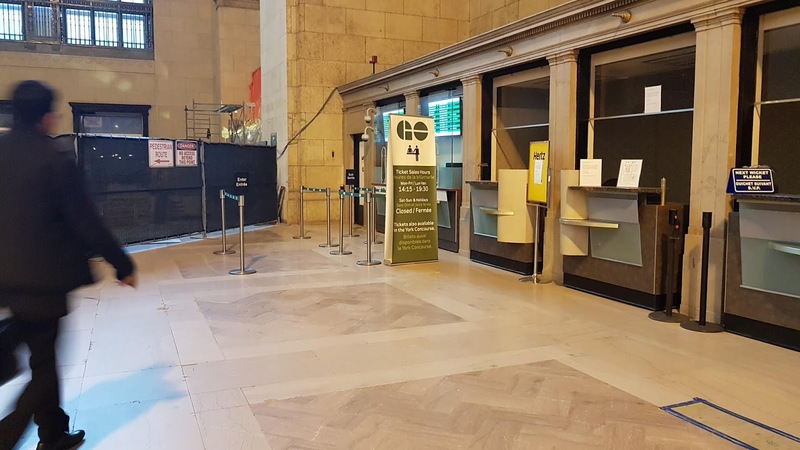 As a result I thought I would send a couple of pictures to update your readers on the latest Burlington Station fail. Picture #1 is a notice from May 2016 which is still posted at Burlington Station. 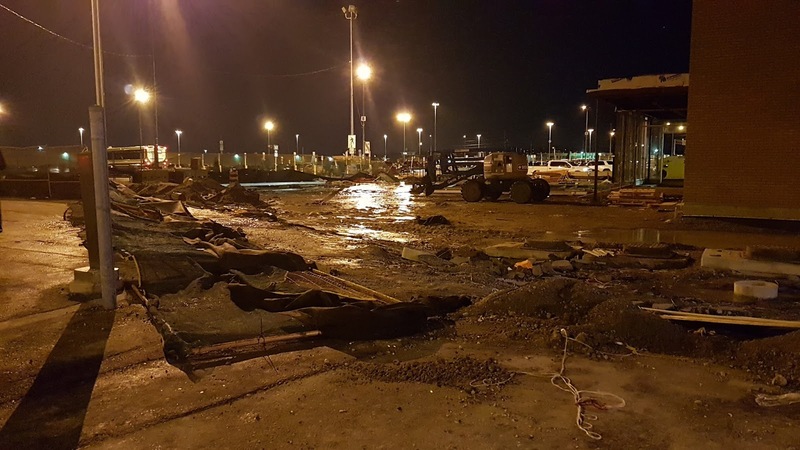 The notice clearly states that all construction will be complete by year end. Of course I’m assuming they meant year end 2016 but I could be wrong…you know what they say about people who assume. 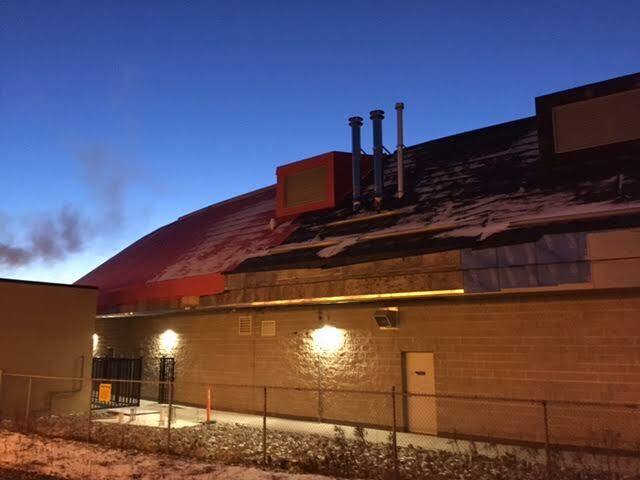 That said picture #2 is a picture of the roof of Burlington Station that I took at 7:00am on Monday January 30, 2017. As you can see by the picture the roof is still not complete. I’m sure I could have walked around the facility and taken several more pictures of incomplete construction work, but I think this one picture says enough. Time to stop promising, and actually get it done." 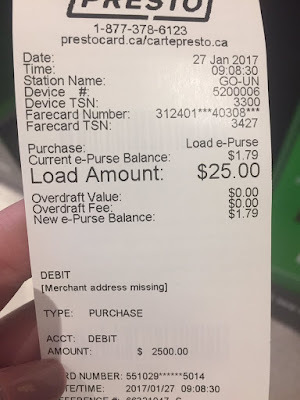 Metrolinx is blaming a “printing error” after a customer complained that a Presto machine appeared to try to charge her $4,000 for a $40 transaction. Last Thursday, J.F. 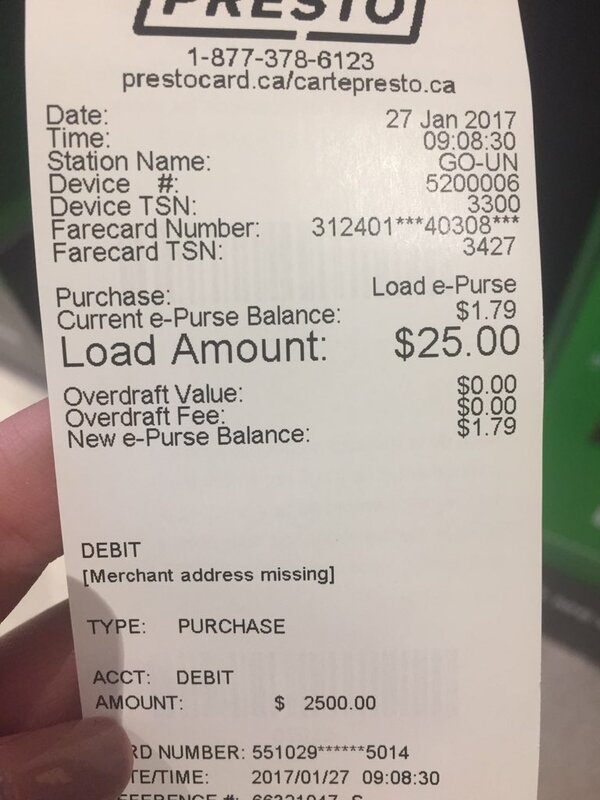 Garrard tried to put money on her Presto card at a self-serve reload machine at Bloor-Yonge station. 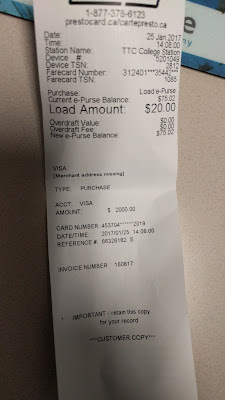 She selected the option for $40, inserted her credit card, and entered her PIN. The machine then stopped working, Garrard said in an interview. An error message flashed on the screen and told her to check her receipt. It's my husband's card but I got the automated phone call (odd ?). I'm just a supplementary card holder. So, they won't talk to me until I get a hold of him to call in. I then tried again using my TD bank card and got a message that my card is not set up for Interac online transactions. Pardon? Yes it is! Anyway, I called Presto. It took an astonishing eight minutes of pressing keys and listening to pre-recorded messages before I was connected to an agent. 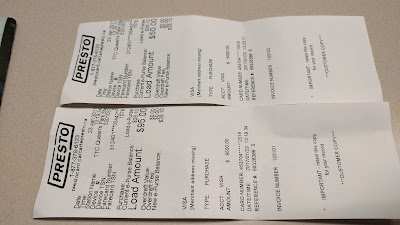 In more Presto news, I received two more emails in addition from the one from a Twitter user showing a Presto load where two additional zeros were added to the amount the person tried to load onto his Presto card. The two emails are from the same cardholder who used two different Presto load machines. One at Queen's Park and one at College - both TTC subway locations. And it's not just happening at machines in TTC subway stations. 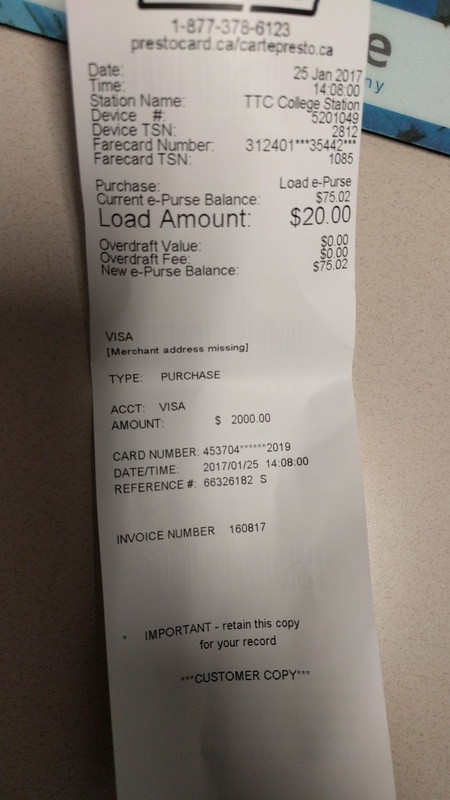 This transaction failed at Union Station and was posted to Twitter by someone who follows me. You would think that Presto would take these machines out of service or upload a message? Or put a notice on their website? Nope. Anyway... having reached out to a senior analyst at Presto about this, I can confirm that it's a software error and a patch from the manufacturer of the machines is on its way. I have been assured that the amounts aren't being deducted from bank accounts. On Twitter, I asked for cardholders to send me proof where the transactions with the extra zeros did go through, by scanning or emailing bank statements. I haven't received any. It shouldn't have taken tweets and emails from me, and others, to get an official answer about this. Presto needs to step up their website's communication methods. I'm pretty sure Twitter is not the best way to communicate with cardholders. Cardholders will try a website first, before they try Twitter. Even the PRESTO card Facebook page makes no mention of this issue, for crying out loud. A CONE OF SILENCE is not how you operate the business for a fare card that supports almost every transit agency in the GTA. Guys! Please. Can we get it together here? Today is a very important day. Today is the day when Bell Canada opens up a very important (and much needed) dialogue on social media about mental health. Each time you tweet or post (to Facebook/Instagram) on January 25 using #BellLetsTalk, Bell will donate 5¢ more to mental health initiatives. I battled postpartum depression for three years. I'm very open to talking about it when the subject comes up. To this day, there's still a strong stigma about postpartum depression and trust me, if you're a new mom, if you're crying in the shower and wishing for the life you had before the baby showed up to come back, I hear you. I know what you're going through. It is absolutely nothing to be ashamed of. I want to tell you, as a survivor, you will get through it, but you can't get through it alone. Please talk to your doctor or find a local CMHA near you by visiting this website. Lastly, I'm here for you. I can be reached by text (9054427423) or email cj@thiscrazytrain.com. You can even call me. I'll listen. I don't get the bilingual sign. None of the on-board communication on GO Transit is in French. Yet, all this energy is spent on bilingual signage. GO's website presents an option in French, but how many of the "on the street" employees, bus operators, transit safety officers and CSAs are fully bilingual? Or is this just because GO operates out of Union, a major transit hub and there's some sort of federal legislation? Or is it just arbitrary common courtesy decided adhoc? My daughter is 12 in April. When I started this website, she was only five (here's a video of her, just a year after launch explaining my logo and masthead at the time). Many of you have stuck around to watch her grow up either through our Facebook friendship or through the occasional post here. For those who don't know, my daughter has Austism Spectrum Disorder and is very high functioning. So high functioning that when people meet her for the first time, many comment how "normal" she seems. No doubt, she's pretty well adjusted, but she has demons she fights. And now that she's older, she's getting better at expressing to her dad and I how these demons affect her. She has difficulty explaining the sensory experience to us. On Friday night, she dropped a bomb on us by blurting out at dinner that music class makes her want to scream because it's too much. All of it - the drums, the clarinets, the horns, the piano. With tears threatening, she told us she can't take much more and asked if we could call the school and tell them she wanted out. I was surprised. She's always gotten As in music. She plays a mean recorder (the Friendly Giant would be proud). Music class has been part of her schooling since grade one. This means that for the past five years, she's been dealing with how it affects her but couldn't tell us, or her teachers. How awful, right? She said sometimes it's so bad, she feels like she's going to vomit, if the sound or texture is too much. I'm not one of those bloggers who uses my readership to openly bare my soul and solicit opinions about my personal life. Over the years, I've written about my health struggles (still ongoing, but improving) and my immediate family. Despite some serious and epic trolling, generally the readership is very supportive, which is why I am reaching out today. You don't have to comment, if you think you can help, you can shoot me an email (cj@thiscrazytrain.com) if you know anything about autism sensory issues, either because you have them yourself, or you've supported others with sensory issues and have some knowledge you can share. We've reached out to her developmental pediatrician (I left a voicemail this morning), who officially diagnosed her at six years old, and are hoping for an appointment, but her waiting list is extensive, sometimes up to a year out for a booking. I don't rely on Google for diagnosis since there's so much misinformation. I will also be engaging the school. One thing she has asked us for is an autism swing claiming she feels this will help her decompress after school (which tells me she's been researching her autism). Even that is difficult to Google since there are many products proclaiming to be a sensory aid. It's all so overwhelming. My goal is to teach her to cope since the real world isn't always going to be accommodating and easy. But I need someone to tell me how to do this. I don't have autism. I don't know where to start. The last time I wrote about a burning double-decker, I wrote "Needs some S'mores" in the title and offended one person who rode to her keyboard on her armchair of social justice to rail against my insensitivity to anyone who has ever experienced a bus fire, seen a bus fire, been on a bus that eventually caught fire or started a bus fire (okay, she didn't write that part but still... ). I can't locate the email. Or else, I'd republish it. In this case, it was an overheated tire that started this fire. No one was injured. I received a direct message from a person on Twitter who wanted to know what was considered "trespassing". Is it just people walking on the tracks or is it also items that were thrown on the tracks (in one instance, a toilet had been tossed and a train had to be halted)? It's a good question, and I'm on it. It would be interesting to know, aside from a toilet, what else has been thrown onto tracks. Nothing beats a sleigh ride to the #gotrain station on an @Durham_Transit bus with broken heat. It's like being in a bus shelter on wheels. Yesterday morning a fight broke out on the 7:03 am GO train leaving Oshawa that resulted in a passenger fetching the CSA to break up the dispute. I only heard this third-party. A woman boarded one coach east of the accessibility coach and collapsed and shoved her SUV-sized stroller into a quad. It was just her and her young child and this move eliminated two seats. Although I am not defending the situation, I will point out that it has been lighter than usual on the morning trains due to this week still being a winter break for many, so I don't think it was a rush-hour crisis. One passenger did not like that this woman decided she could hog a quad and told her so. Words were exchanged, something-something you should be in the accessibility coach. Passengers runs off to get the CSA to settle the matter. CSA doesn't ask anyone to move anything but tells the passenger who complained she is free to sit someone else if she's that bothered by the situation. Lots of chest puffing and shoulder shrugging. Stroller mom was near tears. Look, many of us have been a stroller mom. Mind you, I didn't have an all-terrain stroller but I've seen the dirty looks these mom and dads get when they board buses and trains with these things. It ain't pretty. I got on my second bus (it's a two-bus ride for me each morning, usually) at a different bus stop this morning, more north of where I usually get on (thanks to a lift from my husband so I could avoid my usual 2-bus transfer and a wait in the cold) and before the usual gang of hens I see each day. It's Courtice. There are only 11 of us who take Durham Transit buses in the morning. Everyone else drives. True story. It was one of those "I guess you had to be there" moments. I am dead serious when I say living in a small town commuting to the big city is truly a Groundhog Day (as in the movie) experience. You can set watches by when and where you will see people. A New York City train derailed at a downtown Brooklyn terminal during Wednesday's morning rush hour, injuring more than 100 commuters in the metropolitan area's second major rail accident since late September. Emergency crews swarmed Atlantic Terminal after the Long Island Rail Road train went off the tracks inside the busy transportation hub at 8:20 a.m. local time, the New York City Fire Department said. There's another subway at Union? Or is this Bay Street Concourse stuff? I spent the evening at my in-laws in Beeton waiting 3 hours for a Chinese food pick-up order. Fun times!